Alvin was awarded his AKC Championship from the puppy classes, all owner handled. He won 4 Best of Breeds, 4 Dog World Awards, and 11 High in Trials. 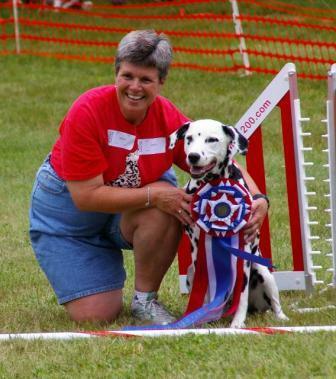 He earned 5 Obedience titles by age 15 months! In 2001, he earned his UD, UCX, and OTCH. He earned Dog World Award #5, 6 High Combineds, 2 more HITs and 43 OTCH points in just ONE MONTH! 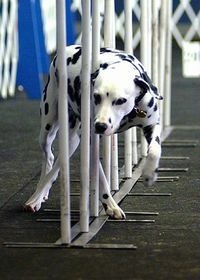 There are currently only four Dalmatians that have an OTCH title, and Alvin and his "house brother" Simon (also owned by Elaine Hamel) are two of them. We are so proud of Alvin and Elaine. Go Team Chipmunks! Alvin has earned another Dalmatian "first"! At the Canin Club De L'Estrie in Sherbrooke, Que, Alvin finished his MOTCh - Master Obedience Trial Champion. He was entered in 2 classes in all 4 trails and won everything - first in all 8 classes and 4 HITs. These wins gave him the necessary points and double Qs to be the first MOTCh Dal. On his last 2 trips to Canada (this weekend and last July), Alvin earned his Can UD and MOTCh undefeated. He won 13 classes in a row, and never failed once in Canada, novice thru MOTCh. 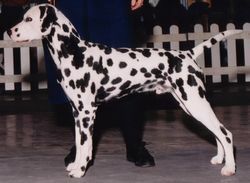 He is only the second dog (any breed) from New England to earn this title. ALVIN IS A DCA TOP SPOT for 2000! ALVIN IS A DCA TOP SPOT for 2001! ALVIN IS A DCA TOP SPOT for 2002! 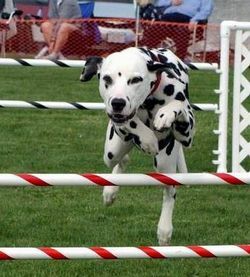 Click here to see Alvin on the Dalmatian Club Of America Featured Dal web page.